Wigton today is a thriving Market Town with a variety of independent shops, stores, pubs cafes and restaurants. Located at the heart of the Solway Plain it is an ideal base from which to visit the beautiful North Cumbria. Wigton is a market town in Cumbria, England. Historically in Cumberland, it lies just outside the Lake District in the borough of Allerdale. 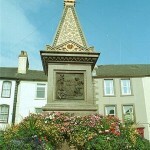 Wigton is at the centre of the Solway Plain, between the Caldbeck Fells and the Solway coast. It is served by Wigton railway station on the Cumbrian Coast Line, and the A596 road to Workington. The town of Silloth-on-Solway lies twelve miles to the west, beyond Abbeytown.